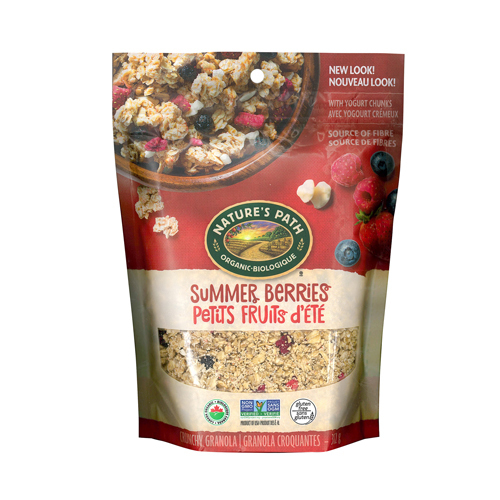 Our new Gluten Free Selections Summer Berries Granola is like sunshine for your taste buds! Really, gluten free that tastes this good? Yes. In fact, our gluten free products are favorites of folks everywhere. Why? Because they flat-out taste terrific! Ingredients like deliciously ripe organic strawberries, raspberries, blueberries and creamy Greek yogurt chunks mixed with gluten free and wheat free whole grain oats, all in our convenient zip top pouch. 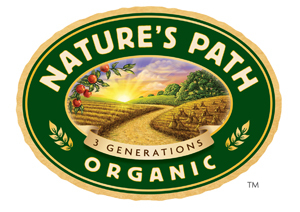 And because we’re Nature’s Path, they’re also organic, non-GMO and free of all those synthetic preservatives and additives. Look for our Gluten Free Selections granola bars and cereals too! You and your taste buds will celebrate! Gluten free rolled oats*, evaporated cane juice*, sunflower oil*, yogurt chips* (sugar*, palm kernel oil*, non-fat milk powder*, lactic acid, soy lecithin*, salt, vanilla*), rice starch*, freeze-dried blueberries*, freeze-dried berry blend* (freeze-dried strawberries*, freeze-dried raspberries*), sea salt, natural flavor, tocopherols (Vitamin E). *Organic. Contains soy and dairy. Produced in a facility that uses tree nuts and peanuts. Vegetarian.